To honor and amplify NERT’s collective wisdom and experience around food, we are launching a “Collective Inquiry” into this topic! We are teaming up with members of the Food Solutions New England (FSNE) network to think about how we can create a resilient, sustainable and equitable food system. Join us online on August 22 at noon as we launch the discussion, and/or join us online on Slack anytime over the following several weeks. Sign up below! How it will work: We will launch the Inquiry on Monday, August 22 at noon on Zoom (an online platform with video and phone-in options). For the following several weeks, there will be ongoing “text-based” conversations on Slack, an online platform for discussion and collaboration, as well as additional calls on Zoom. See the full schedule here. Sign up below! You can then choose how to engage. Chances are, if you are involved in Transition or community resilience, you are somehow connected to the local food movement. You might shop at a farmers market, be part of a CSA, grow some of your own food, or even work as a full-fledged farmer. We all eat! And there are many ways to be involved. What are the challenges and successes in your local food work — the farmers markets, CSAs, farms, permaculture projects, food forests, and more? As individuals, what are the challenges in securing affordable, nutritious food that squares with our values? What could a regional-scale food system look like, as opposed to the current global system? What would we eat? Who would grow it, and where? FSNE has identified three areas where more work is needed in order to build a regional food system: 1. democratic engagement, 2. a new food narrative, and 3. models for business success for farmers, suppliers and beyond. Let’s dig into these topics to create a regional food system that squares with our values. On August 22, we’ll be joined by members of the FSNE network who will share a bit about the Vision and System Map for change. Then, we’ll break into small groups on the food-related topics that interest us. Participants will be invited to suggest topics. We’ll then identify what next steps we’d like to take. Are there resources that would be helpful? Other people in the food world we’d like to hear from? 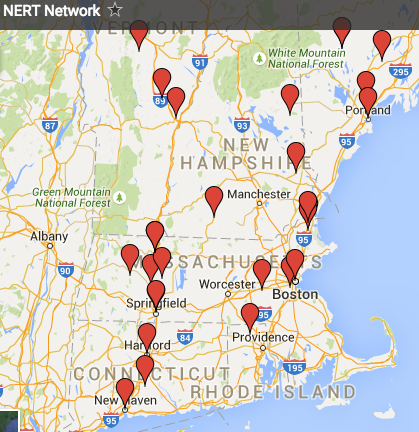 NERT can help locate resources and make connections happen over the course of the Collective Inquiry. If you are in the Boston area, also check out our in-person event on food on Wednesday, August 17. After you register you will will receive details on how to join the video/phone discussions and an invitation to join us on Slack, where the food conversation will be ongoing throughout August, September and October 2016.